Presonus AudioBox 96 is everything you need to record and produce. A complete hardware and software recording kit. Based on the AudioBox USB 96 audio/MIDI interface, an award-winning Studio One recording and production software, PreSonus’ AudioBox 96 Studio is an excellent starter package for the burgeoning music producer to start recording. 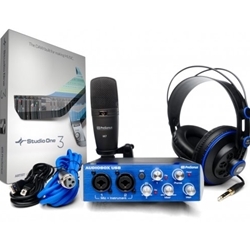 The package comes with PreSonus’ AudioBox USB 96, a handy audio/MIDI interface with two combo mic/instrument inputs; the M7 condenser microphone, a large diaphragm condenser mic; and the HD7 professional headphones. A great choice for mobile musicians and podcasters, the 2-channel AudioBox USB 96 is bus-powered, compact, ruggedly built and works with virtually any PC or Mac recording software. It boasts high-performance Class A mic preamplifiers and professional-quality, 24-bit, 96 kHz converters. And it comes with PreSonus’ amazing Studio One 3 Artist DAW software for Mac and Windows. Get your mic collection off to a good start with the M7 large-diaphragm condenser microphone. Condenser mics are the overwhelming choice of recording studio professionals, enabling you to capture musical details, harmonics and subtle nuances that would get lost with dynamic mics. Large-diaphragm condenser microphones, like the M7, tend to “warm up” a sound, making them the go-to microphone for recording vocals and a wide range of instruments.